Guardians Of The Galaxy was stuffed to the gills with aliens, side characters and creatures. But there was one character that we didn't see on screen, Nova—a character so hotly anticipated folks were certain Nathan Fillion was secretly cast as this strong-jawed space cop. 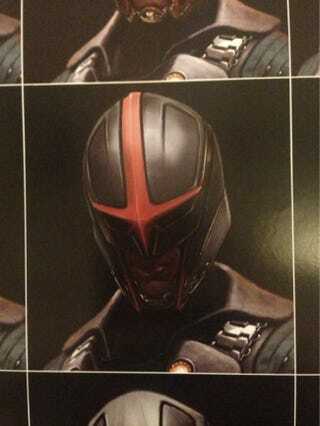 He wasn't, but here's what Nova could have looked like. Cinemablend has a picture from the Guardians Of The Galaxy: The Art Of The Movie art book (which is LOADED with amazing GOTG art) of the never before seen, much-hyped character Nova. For those of you unaware, the Nova Corps are the space cops of the Marvel cosmic comic book world. Nova is basically the prime guy, numero uno, and gets to do a lot of awesome stuff. He's also been killing it in the comics lately (so I hear). All signs point to a Nova appearance somewhere down the MCU road. And this is what he may turn up wearing.